Pattern Description: Shirts A, B, C and D have front gathers, princess seams with topstitching, front bands, collar and sleeve variations; shirt A has stand-up collar, elbow length and gathered bubble sleeve; shirt B has self ruffles, collar with collar band and gathered sleeve with cuffs; shirts C, D have collar with collar band and pleated sleeve with cuffs; shirt C has self ruffles; includes separate pieces for A/B, C, D cup sizes. Pattern Sizing: 6-20. The first black version I made in a size 10 with a C-cup. 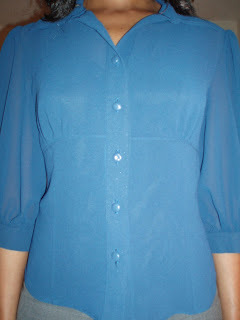 The blue shirt I made in a size 8 with a C-cup, which was a better fit. Did it look like the photo/drawing on the pattern envelope once you were done sewing with it? Yes. I made View B. Were the instructions easy to follow? Yes, the instructions were very easy to follow, but time consuming to execute. What did you particularly like or dislike about the pattern? Likes: The puffed 3/4 length sleeves; the front gathers; the princess seams; the top stitching; the cup size choices. Dislikes: The fact that the pattern tells you to endlessly slip-stitch the collar stand, the front band, and the sleeve cuff. The slip-stitching really slows down the construction process. For both shirts, I ended up just using a machine stitch down the side of the front band just like in View D(?). I also machine stitched the collar band on the blue shirt, and I now wish I had slip-stitched it instead for a nicer finish. Fabric Used: Thin black cotton (blend?) 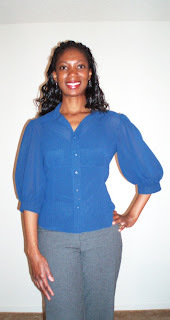 shirting and sheer royal blue poly crepe. Both were from Wal-Mart’s $1.00/yd table, and they are unlined. Pattern Alterations or any design changes you made: I left off the ruffle for both of the shirts. Ruffles positioned there on the chest look so fussy to me, and I wanted to go with a nice, clean look. 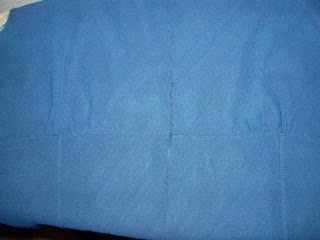 On the blue blouse, I top-stitched 1/8″ from the seams along all the lower sections and under the bust line. Also I tried my hand at covering the buttons for both blouses, and I like the overall effect. Would you sew it again? Would you recommend it to others? Well, I’ve already sewn this blouse twice. I think two are enough, but it’s such a stylish, but classic-looking shirt, that having it in a few basic colors would be nice. I would certainly recommend this shirt to others. 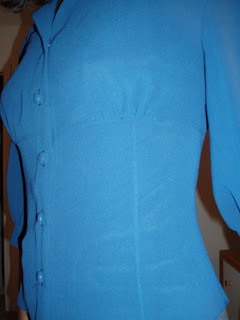 It is good for intermediate sewists who have sewn a few collared shirts. Conclusion: It really is a nice shirt, and if you take your time, you will get pleasing, even RTW results. A co-worker complimented my black shirt. 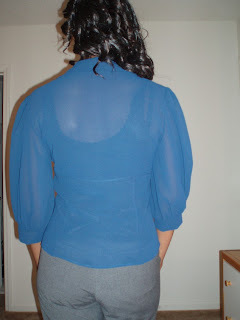 This fabric is very sheer and needs a camisole underneath. Beautiful blouses, Pirouette! I am in awe of your productivity. You create such beautiful clothes! 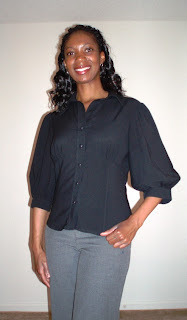 These blouses are superbs and fit you perfectly! I particularly love the sleeves details… Well done! You look great!You did a great job!!! Great blouses. You look nice in them. Nice blouse, I love the color you chose. Beautiful! I have this pattern and my first one didn’t look as nice as yours. I may have to pull that pattern back out and try it again. Great job! How long have you been sewing?